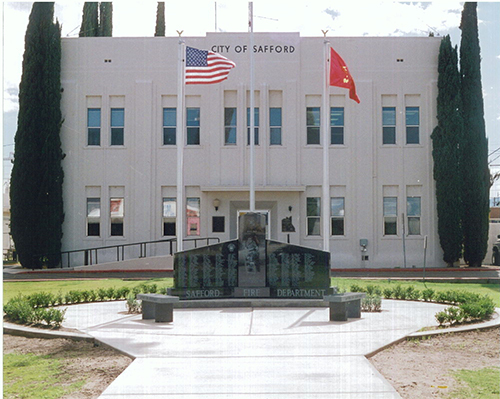 SAFFORD – Employees at Safford’s City Hall are accustomed to being dumped on but this takes it to a whole new level. Derek Aranda, 18, has been charged with criminal trespass in the second degree after being caught hiding in a fenced area of City Hall. When confronted, authorities also located several different locations where someone had defecated. According to a Safford Police report, on Monday, Jan. 1, a passerby noticed Aranda in the fenced-off area shortly after 7:30 p.m. and called the police. Upon arrival, an officer located several firefighters who were working in the area, but they said they hadn’t seen anyone. Further inspection revealed Aranda hiding in an area that is protected by a chain-link fence topped with razor wire. Safford Fire Chief Clark Bingham opened a gate to the fence with a key and Aranda was taken into custody for trespassing. Upon contact, the officer reported seeing a wet spot on the concrete along with human feces. Aranda allegedly told the officer that he had climbed the fence in order to access City Hall’s wifi (which is not necessary as it can be accessed outside of the fenced area) and then relieved himself because his stomach hurt. The officer then pointed out the several other spots of human feces and questioned Aranda if he had been there in the past and had just made the area his toilet. Aranda allegedly admitted to entering the area several times in the past and apologized for his actions. He reiterated that he wasn’t homeless but that his stomach hurt so he had to relieve himself where he was. Aranda was given a trash bag to clean up the feces. Afterward, he was given a citation for trespassing in the second degree and then transported to his residence.